NOTE TO READERS: For the remainder of this week, text and responses to Comment requests will be delayed, likely to the night after the Top 150 charts have been posted. NBC: All ratings held from prelims, which meant GRIMM was down 0.1 from last week and DATELINE was up 0.1. ABC: No change from prelims, and LAST MAN STANDING, DR KEN and SHARK TANK were all up 0.1 from last week, while 20/20 was down 0.1. CBS: THE AMAZING RACE rose 0.1 in finals, leaving it still down 0.1 from last week, as was BLUE BLOODS, while HAWAII 5-0 was steady. FOX: As the prelims had reported, a rerun HELL’S KITCHEN was 0.2 behind last week’s SLEEPY HOLLOW FINALE, and a new HELL’S KITCHEN was up 0.1. CW: No change for THE VAMPIRE DIARIES (up 0.1 from last week) or THE ORIGINALS (steady). CABLE HIGHLIGHTS: On a very quiet Friday, Adult Swim’s CHILDRENS HOSPITAL had the lead, despite dropping 0.15 from last week to 0.45. 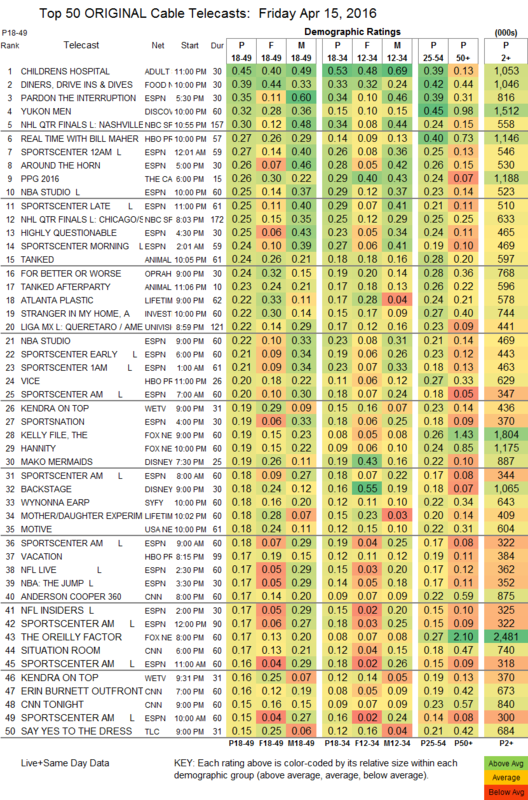 Food Network’s DINERS, DRIVE-INS AND DIVES gained 0.03 to 0.39. Discovery’s YUKON MEN ticked up to 0.32. NBC Sports Net hit the Top 10 with the NHL PLAYOFFS at 0.30, with another game at 0.25. On HBO, REAL TIME WITH BILL MAHER was up a hundredth to 0.27, and VICE had an impressive bump for the night, up 0.08 to 0.20. 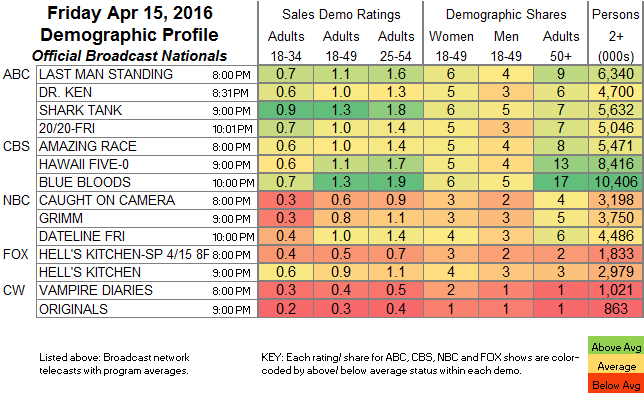 Cartoon Network’s 6PM PPG 2016 was down a tenth to 0.26. OWN’s FOR BETTER OR WORSE dropped 0.05 to 0.24. On Lifetime, ATLANTA PLASTIC gained a tick to 0.22, and MOTHER/DAUGHTER EXPERIMENT was similarly up to 0.18. We’s KENDRA ON TOP was at 0.19/0.16, up from last week’s 0.15/0.14. Syfy’s WYNONNA EARP rose 0.03 to 0.18. USA’s MOTIVE lost 0.04 to 0.18. Bravo’s THE PEOPLE’S COUCH fell 0.07 to 0.13. Cinemax’s BANSHEE was down 0.02 to 0.08.